TwitchTV is doing a giveaway for 1,000 beta copies of StarCraft II: Heart of the Swarm! The sweepstakes runs from now until September 24th, and the winners will receive their beta invite in their emails directly from Blizzard on September 28th. If you want to enter to win a key, click here. Good luck! Blizzard has released the Heart of the Swarm beta for selected users to play! If you would like to participate, be sure to opt-in for the StarCraft betas in your Battle.net account. Check out this page for some Q&A from Blizzard. If you would like to download Heart of the Swarm right now, use the links below! These links are only for people who want to have the game ready to play on their computers. You do need a Battle.net account with the HotS beta to be able to log in. Without the HotS in your account, you’ll only be able to see the log in screen. StarCraft II: Wings of Liberty patch 1.5.0 is now live! This patch features significant user interface changes to Battle.net, including the addition of the entirely new Arcade game menu, A new streaming launcher, QuickNav, graphical improvements, new Editor modules, and a number of bug fixes. Be sure to check out the full patch notes to learn all about the latest changes. Google released an entertaining StarCraft-related easter egg today, for reasons unknown yet. To see it, just go to google.com and search “zerg rush”. Your search results will be attacked by a bunch of “zerglings” which will group up at the end to spell out GG. So apparently you can kill those “zerglings” by clicking on them to get a high score and post on Google+. I read somewhere that this whole thing might have been created to be a promotion for Google+. Anyway, I think it’s pretty cool that Google made something for us StarCraft fans. A new SC2 patch is out today that fixes a bunch of bugs, and also includes a few balance changes. Check out the spoiler below for all the changes. HuskyStarcraft has posted a video up showing that it is possible to stack Siege Tanks, as well as other units like Thors, by dropping them in tight spaces with Medivacs. This was originally discovered by DerNalia, who was a victim of this attack in a game, and had posted a screenshot of it on the reddit StarCraft forums. Blizzard will likely fix this bug in an upcoming patch, as they have done so with these types of exploits in Brood War. HuskyStarcraft has also made a 2nd video showing tank-stacking with buildings here. This patch includes some bug fixes, decreased costs to everything in the Protoss Forge, and the Terran Ghost has a small nerf to its EMP radius. 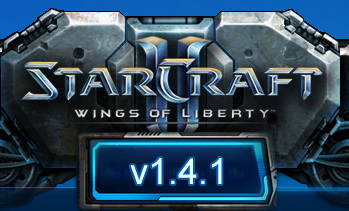 Blizzard has released a new patch (v1.4.0) for StarCraft 2 today. This update contains a huge list of changes which include user interface changes, unit balancing, bug fixes, and map editor improvements. You can read the whole patch in the spoiler below. Sorry, I’m a couple days late posting this, but there is a new patch on SC2 that fixes some bugs.